During 1909-1922, the London and North Western Railway embarked on a large-scale project to electrify their whole London inner-suburban network, encompassing the lines from London Euston to Watford and the North London Railway from London Broad Street to Richmond. This also included branch lines such as Watford to Croxley Green (where a depot was built to house the electric units), and links to what was to become the London Underground network. For this reason, the lines were electrified using the fourth rail 630V DC system, the electricity being generated at the LNWR's own power station in Stonebridge Park. 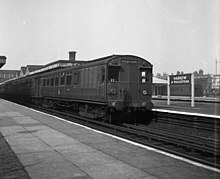 The first electric passenger trains ran in 1914, limited to the West London line route (Willesden to Earls Court), and full services over the whole network did not begin until 1922, work having been delayed by the First World War. The London, Midland and Scottish Railway extended the network in 1927 by electrifying the branch to Rickmansworth. This page was last changed on 10 July 2018, at 23:32.